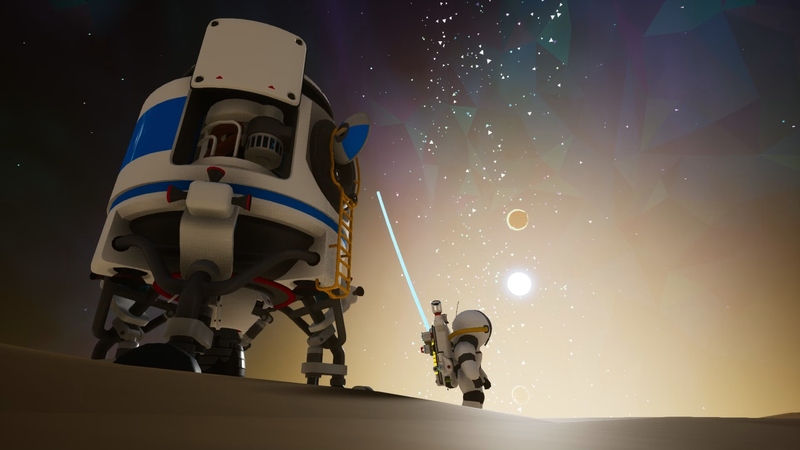 “You’ll get to explore the galaxy!”, they said, tossing bits like “who knows what awaits out there?” and “it’ll be fun” into the conversation, whenever the topic of me venturing into space as an Astroneer came up. Little did I know at the time just how right they were. The things I did, planets I visited, the discoveries I made – it was just a grand ol’ time, really. Wasn’t like that from the get-go, however, for while I did patiently wait until the game left Early Access, acquiring my review key from the developer shortly after that milestone had been reached… all was not well upon setting foot on this brave new world. Performance issues and crashes – most of which have fortunately been dealt with at the time of writing – much delayed what I was hoping to be a soon-after-launch review, but better late than never, right? Well, here’s the thing: in spite of Astroneer running rather sluggishly and crashing frequently, I still had an undeniably good time. Perhaps even more so due to the fact that I was not entirely alone on this journey? Multiplayer being a thing and all, I figured, might as well rope a friend of mine into accompanying me for some scientific planetary deformation (which was in fact how the first hour or two went by, terrain reshaped left and right, oxygen supply be damned). But… let’s take it from the top, one tether at a time. Upon starting anew in this ‘space sandbox adventure’, players are going to find themse– wait, no. I’m actually going to recommend something that might sound a tad odd here, and that is to start with the tutorial. Unless of course you prefer experimenting without any knowledge of how everything works, in which case, go nuts, you crazy daredevil. As for everyone else, do start by learning about oxygen supplies, tether lines, crafting, gathering, inventory management, and so on. By the time this optional tutorial is over, you’ll possess knowledge that will take you from humble beginnings and all the way to interplanetary explorer; provided you can gather and utilize the resources required for each step, that is. See, while the dropship you arrived in does magically transform to a shelter – which, for now, is your base of operations – that’s pretty much all it is. Oh, and a source of power. That’s important too. Otherwise, none of that fancy gear you need will do anything. At all. Ever. Power is good. Just don’t go mad with it, ya hear? 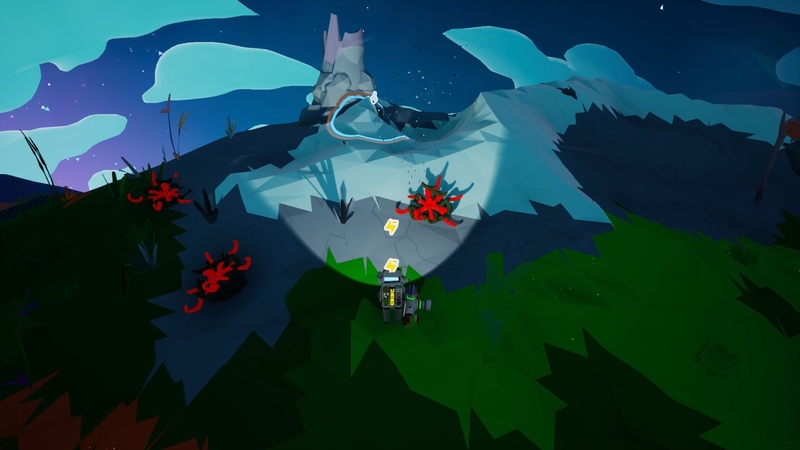 Seriously though, to get anywhere in Astroneer, players will have to spend quite a large chunk of time messing with the terrain, sucking up dirt, mineral, and other fun things, courtesy of this not-so-tiny thing called a Terrain Tool. Much easier than going block-by-block, Minecraft style, although it is also noticeably harder to be precise with, and it uses power. Power which recharges automatically, provided you’re near a tether line or have some sort of alternate means of generating it. No power means no terraforming. So keep an eye on that yellow line on your backpack at all times. 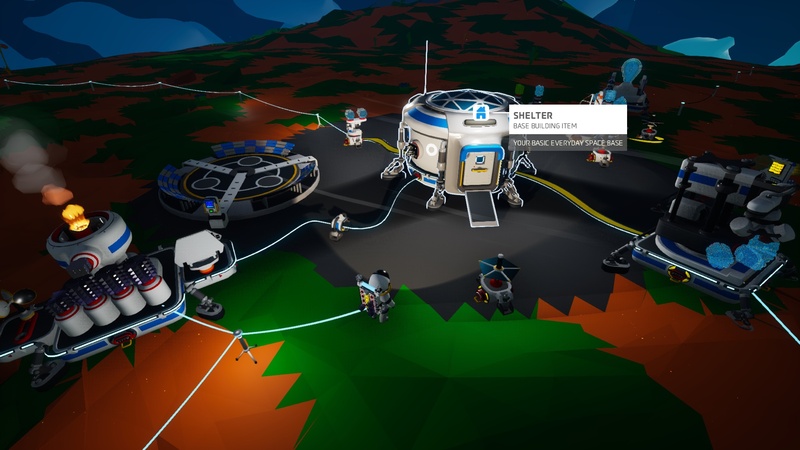 Ah, speaking of tether lines: while setting up a network of these as you go about exploring might seem like a chore, it is the easiest way to maintain a steady oxygen (and power) supply. Until such time when you are able to gather materials which allow for the printing of more advanced equipment, as then you’ll be able to wander slightly more freely, even if the almighty tether will still need to be revisited sooner or later. But there’ll be none of that until ample compound has been gathered and turned into tether bundles, which brings me back to the terrain tool. If you’re anything like me, the lack of control and the relatively slow speed at which this thing operates is going to make you wonder just how tech hasn’t progressed further, seeing how the game takes place in the 25th century and all. Fortunately, like with most other things – including that tiny printer built into your backpack – the terrain tool will be expanded upon as you progress, becoming quite the beastly piece of gear, courtesy of modular extensions. Not only do these increase the speed at which the tool vacuums everything pointed at, but also the area of effectiveness; a combination which shall prove incredibly useful for exploring below the surface, digging tunnels in whichever direction. There are even mods that enable players to simply gather without deforming the terrain at all. Hardly the most useful of the lot, sure, and you can only equip so many at a time, but still nice to have for those moments when you want to gather without leaving huge craters behind. Although again, before you get to any of those fun little terrain tool tweaks, you’ll have to do a fair amount of exploring, gathering, and printing – likely in that order too. Won’t get far without a medium – and eventually, large – printer after all, and certainly nowhere near another planet. What? Oh, surely you didn’t think this one planet, however new and exciting, was it? Heck no. A total of six other awaits, once your little astronaut is ready and able to venture out into the vastness of space… again. On a related note: this was one case in which I was particularly pleased to have brought a friend along, as mistakes were made and my rocket touched down without enough fuel for the return trip. Less than ideal, to say the least. But like I said, bless System Era Softworks, Astroneer‘s developer, for the inclusion of multiplayer, as without it, I would have had to start from scratch. Instead, a rescue operation was mounted, my space comrade constructing a rocket back at our base to bring me the fuel I so badly needed to return. Thinking back, I can’t help but wonder if there was something I had simply missed, as it would be incredibly odd if a player could, in fact, end up stranded like I was, should he/she make the mistake of burning fuel prior to departure? A peculiar turn of events, those. Right. Anyway, once you reach that second planet, you’ll likely come to realize just how much there is to see and do, even if a lot of it is… a tad repetitive (see: terrain tool). Who cares though, long as it’s fun? The more planets within reach, the more fun gadgets and gizmos can be printed, expanding the possibilities at a steady rate. That said, a bit of patience will be required for certain aspects, as 3D printing in-game – much like in our world – takes time. At least you’re free to wander off into the distance with that ever-growing tether network while various minerals and ores are churned into a brand new piece of equipment, so there’s that. And wander you most certainly shall, perhaps even setting up a second (and third?) 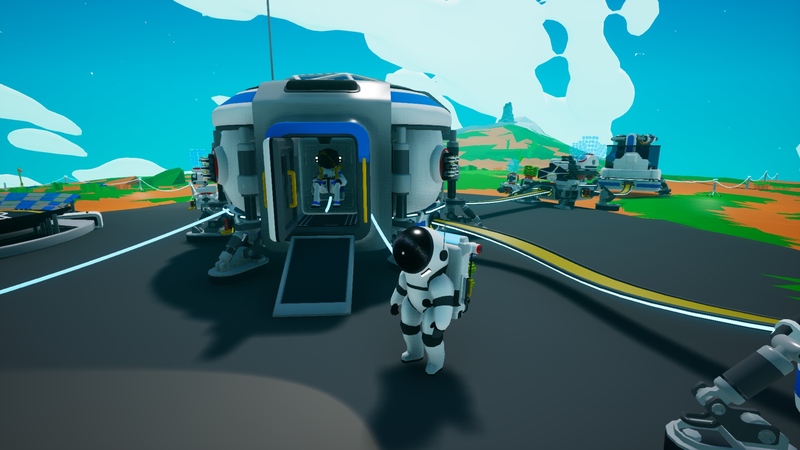 base as you go along because several of the many resources available in Astroneer are quite scarce – and you’re going to need them all, sooner or later, to progress your… research. Doesn’t really matter if you are a man/woman of science because, without research, the vast majority of equipment will remain forever unavailable to you, making for an overall rather limited experience. Or put differently: conduct that research, darn it! That’s what I want to say at least, but it’s not just a matter of pressing a button and waiting for a bar to fill. Actually, it kinda is, only, there’s more to it than such. See, in order to unlock additional options in your printer(s), you’re going to need bytes (aka. research points). These are acquired either by scanning specific objects or bringing a research item back to the research chamber, at which point the chamber will spend what feels like an eternity analyzing it to create bytes. Simple enough, and even though worlds are procedurally generated, chances are you’ll find more than enough research items lying around to unlock everything. I’d recommend building/printing towards a vehicle capable of towing these back to the base sooner rather than later though, as carrying them… well, let’s just say they’re rather heavy. Then, once the bytes start pouring in, everything from terrain tool mods to storage constructs and even a massive spacecraft is no longer but a distant dream. Like I said earlier: from humble beginnings to interplanetary explorer. 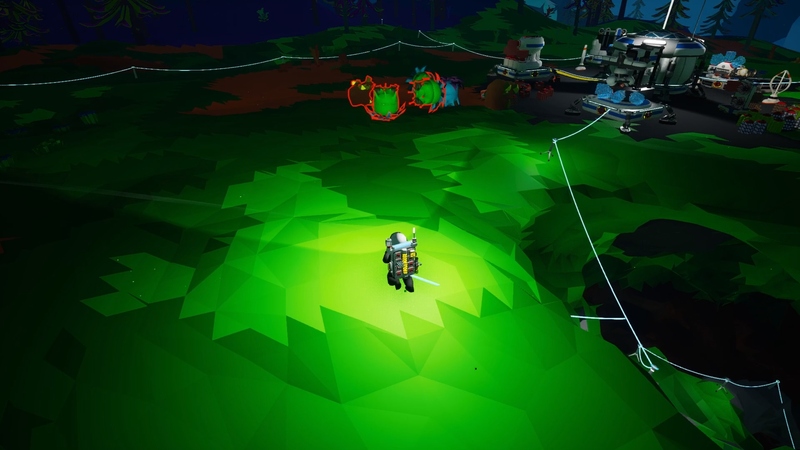 None of the things you can build in Astroneer will save you from fall damage, however. Which brings me to a point of frustration: for whatever reason, no matter the design/skin chosen for your character, physics are never entirely on his/her side. I often found myself sliding along like on an ice rink, resulting in the occasional death while attempting to delve deeply and greedily into underground caverns. Seeing how your inventory is emptied at the location of your (untimely) demise, this can be particularly troublesome; although the game does drop a beacon of sorts to make recovery less of a hassle. Ah, almost forgot to mention how the ever-impressive terrain tool serves another purpose, beyond simply sucking up, well, everything: spitting it back out. 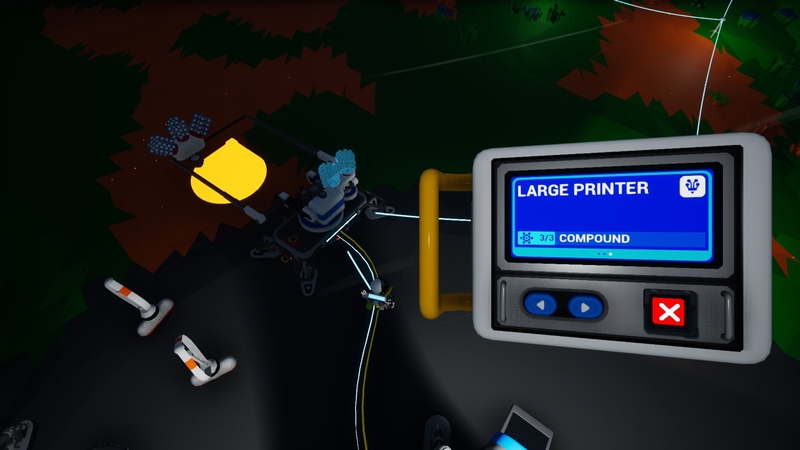 No really, and this also ties nicely into my problem with the physics, as once a canister has been printed and equipped, you are able to move soil around… more or less. This did make otherwise incredibly hazardous ventures into dark caves significantly less tense, knowing I always had the means required to build a path to the surface. Took some time, patience to get the hang of it, but once I did, the explorer in me truly awakened! 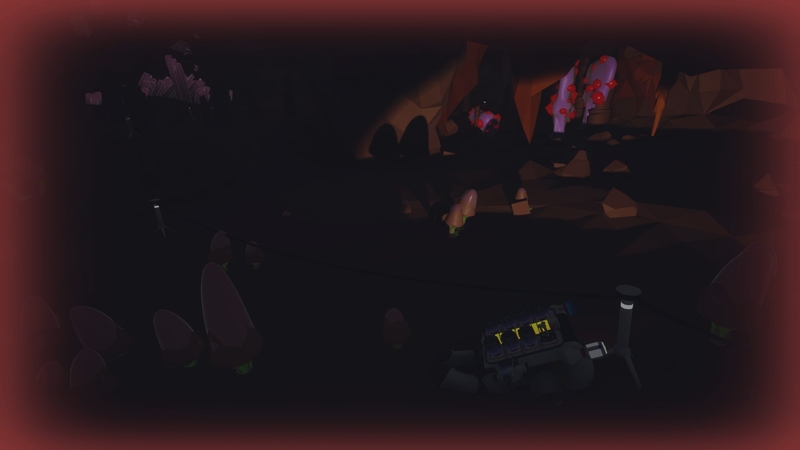 Gaps across chasms were bridged in mere moments, caves explored with far more eagerness, and I may even have attempted to build an odd monument or two while waiting for the smelting furnace, research chamber, and chemistry lab to do their thing. Sure, I could have simply ventured out into the world, as mentioned earlier, but wandering too far from the base would leave the machines unattended. Not that there was any risk of them breaking down or some such, but with no one to start another batch – my aforementioned space comrade off on an adventure somewhere – the potential for downtime later was too great. We did, after all, need those ores and other gatherings processed to further our, well, scientific affairs. By which I mean, bigger and better versions of… everything! Early on, a small printer and a medium platform will do just fine, but eventually, you’re going to need larger and more capable things. And not just because bigger is (almost) always better either. No, a lot of equipment simply won’t fit on anything but the largest of platforms and seeing how everything needs a power supply, you’re gonna want to look into ways to eliminate clutter pretty soon (ie. extenders). Head spinning yet? If not, then this next part should do the trick: all that time you’ve spent setting up a base, right? Yeah. You’ll have to acquire the resources to rebuild it on every planet you visit (or at least, most of them). It’s easier than making frequent trips back home, especially once you’ve reached the furthest, most distant planets as then, well, you’re gonna need a lot of fuel to get back to that first base. But that’s just how it is – we are after all talking about entirely different planets here, each with its own environmental hazards and resources, not just a stroll down the block. 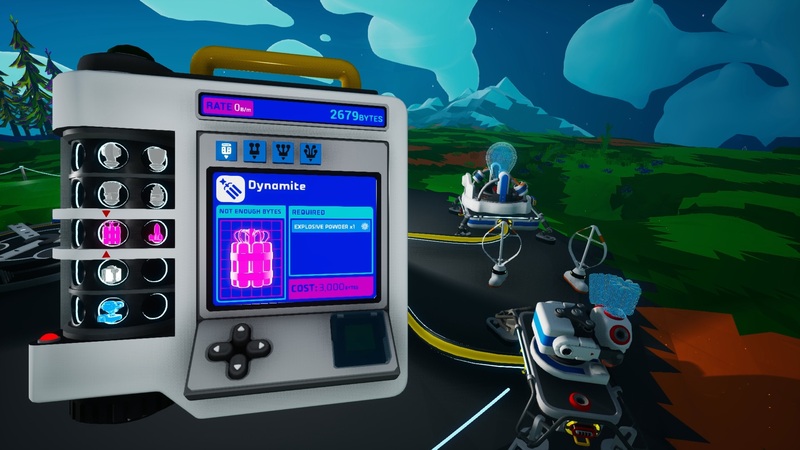 I should probably mention at this point that while Astroneer can seem quite overwhelming, an in-game ‘reference card’ does exist to help with the most basic features and actions, along with a resource index. An index which provides a glimpse into the (distant) future for new players, as well as, you know, a method for figuring out what that icon on that mystical thing lying up ahead without power means (or which resource it needs, rather). Basically… it’s all about the resources! Resources and exploration, so that you may construct bigger and better equipment, eventually… boldly going where no man has gone before! In other words, you’ll have to make your own story, because while the progression path is made abundantly clear, how you go about getting there (and to the next planet(s), why that is entirely up to you. No need to rush either. Want to build a massive base that spans the entire planet with a tether network to match? Do it. More interested in carving out one or more planets like pumpkins? Uh, best of luck to ya, but well, perfectly doable. I think. All in all, while the game can take a bit to show its worth and really get going, the slow-ish beginnings will give way to massive base building, grand exploration and… well, who knows what might be added? While its creator is currently focused on fixing remaining bugs and performance issues, mention has been made of planned content additions. But that’s for another time, and seeing how there’s no guarantee of it actually happening, I’ll just say this in closing: in its current form, this game is well worth the asking price. One can easily lose countless hours in its vast world, growing ever more powerful. In theory. If power is measured by technological prowess on distant planets. Which I guess it is in this game? 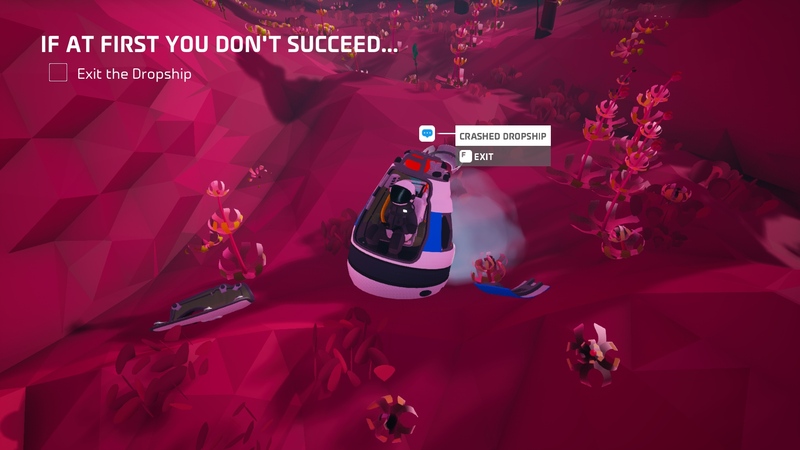 Either way, highly recommend picking up a copy of Astroneer. Right now. Bring a friend… or two… or three. And fuel. Lots of fuel. So much fuel! Astroneer is available on Humble, Steam, and Xbox One.